Which Automaker Will Resurrect an American Icon? Buick didn’t unveil this Buick Regal Estate Wagon in Detroit earlier this spring, but I’m thinking maybe it should have. American car shoppers can buy a crossover, SUV, station wagon, hybrid, convertible, sedan, coupe, 2-seater, minivan, pickup and the list goes on. Those consumers can choose from a wide array of colors and an endless list of options, but they can’t buy something that was once ubiquitous on the roads and highways of the USA: the woody wagon. Even though station wagons with wood on the sides or vinyl covering that looks like wood were on the marketplace from the 1930s to the first decade of the 21st century, not a single automaker offers the woody option today. For years, station wagons with faux wood paneling bearing the names Estate, Country Squire, and Town and Country were in driveways across America, but for those of us wanting to satiate our inner Clark Griswold, there is some encouraging news. According to several reports, Fiat Chrysler is planning to reintroduce the Jeep Wagoneer, last seen in its iconic form in 1991. The Wagoneer name was later moved to the smaller Cherokee, which received the wood treatment for a few years before the Wagoneer name was jettisoned. The new Wagoneer is expected to debut in 2019. Sign me up! My wife Kara Sundlun drove a white one in college and my co-anchor Denise D’Ascenzo had a brown one she took to the TV station every day. Which got me to thinking, will other automakers sit back and let Jeep have all the fun? General Motors last offered a wood option on its 1996 Buick Roadmaster wagon, Ford closed the woody chapter with its 1991 Country Squire and Mercury Colony Park, and Chrysler threw the faux wood on a minivan in the 1990s and the PT Cruiser at the turn of the millenium. The woody drought is going on more than a decade. On April 4th suburban Detroit General Motors unveiled the hot looking Buick Regal TourX, called a station wagon by all those who saw it. No wood siding was offered, so a graphic artist friend of mine created the picture above. At an event for the New York Auto Show, I pitched the woody idea to Buick Vice President Duncan Aldred. He chuckled, but said he appreciated my passion. Buick spokesman Stu Fowle told me ” it won’t be happening.” Tom Worobec of the Automotive News liked the rendering and felt it had potential. After I posted the Regal Estate Wagon on my Facebook page, those who wanted one easily outnumbered the haters. I’m not the first to suggest a revival of the American woody, in fact a few years ago the cable television show Top Gear, created this 2011 Buick Roadmaster wagon. 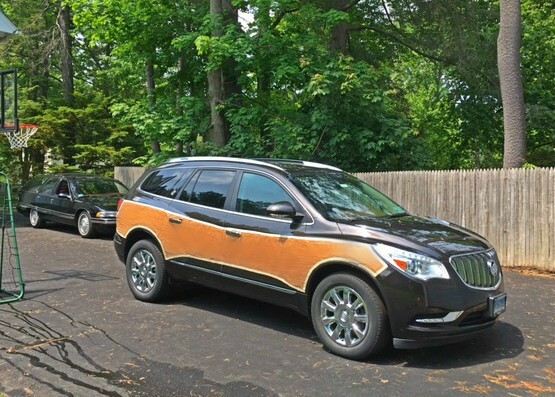 I’d buy that or the right woody wagon in a snap, so last year I temporarily customized our 2013 Enclave to get a slight sense of what it might look like if dressed like a Country Squire. Some contact paper and masking tape, and sure, it needs tweaking and an iron, but you get the picture. Personally, I think these would sell well. Have you seen the prices people are paying for an old Wagoneer or 90s era Roadmaster? The first automaker to bring back a woody will get a wagon full of media attention that could have people across the country saying “want.” The second to do it will look like a copycat. Come on GM, Ford and Chrysler, America is ready for the return of the woody. Build it and we will come. In the spirit of full disclosure, I’ve owned two Buick Roadmasters, including one with the paneling. My parents had three Ford station wagons growing up, including one festooned with fake wood. By the way, my friends at Scranton Motors told me if I get one of the new Regal wagons, they have a guy who can add the faux wood siding. Hmmm. Can you identify these woodies? Coming from a Wagon fan I’m pondering the same question. I suppose if the demand is significant enough the car companies will supply the Wagons but I know little about car manufacturing as of 2017.